Owing to our incredibly late departure and arrival to our bungalow on day 1, Bita, Sunny and I decided we would sleep in and get a mid morning start today. We hit the snooze alarm a few times, made oatmeal with diced nectarines atop and snacked on vending machine treats we found not far away. We looked forward to a beautiful day of inland cycling and spending the night with some dear friends of mine. Wanting to keep our route simple (we had gotten turned around on our mountain pass the day prior) so we decided to take highway N-11 most of the day. 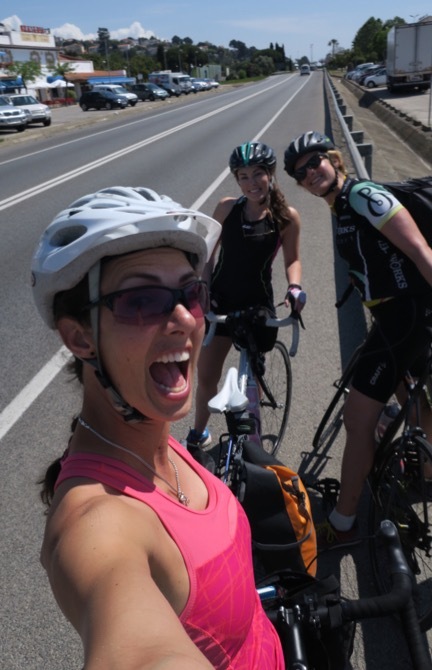 Highways have their pros and cons for bicycle touring. Pro: they tend to be paved and direct. Cons: they can be shoulderless and with fast traffic. Today we were up for the challenge and looking forward to eating up some miles quickly. As we made our way inland N-11 started out hot and hilly, causing us to slow our pace and throw in our earphones. Not long after we were silently toiling through the heat when Bita’s bike started making a funny sound, as if something was hitting her rear tire. Our first flat of the trip! 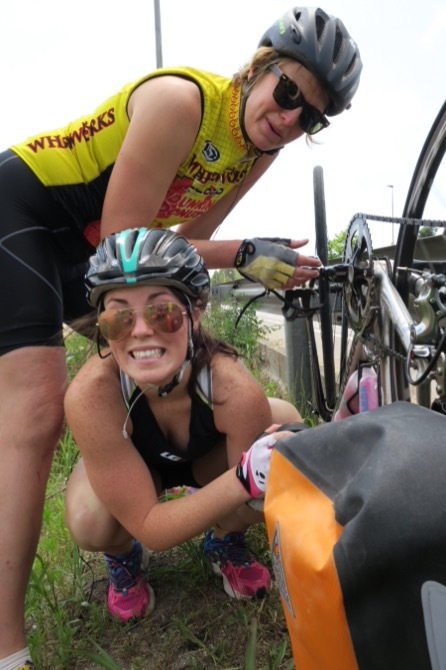 We lugged our bikes over the highway’s guard rail to change the tube. I could hardly believe we got a flat on only our second day. This is going to be a crazy summer! Flat #1 of the trip! The hot inclines gave way to gorgeous Spanish countryside and rolling hills. 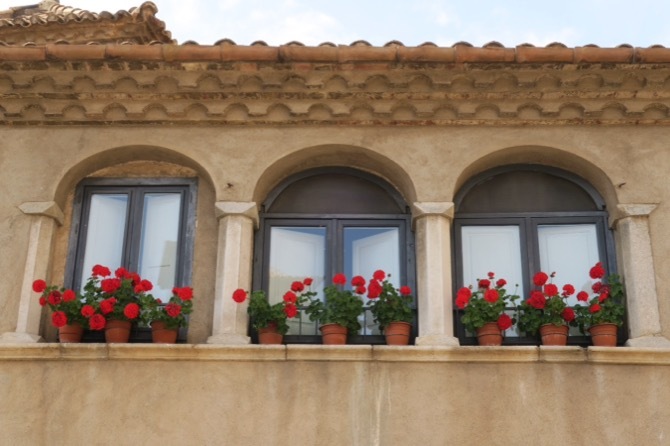 Stucco houses with red tiled rooves dotted the landscape and everywhere I looked I wanted to photograph and frame my surroundings. Catalan–the region and pseudo nation we have been cycling in since Barcelona–is gorgeous. 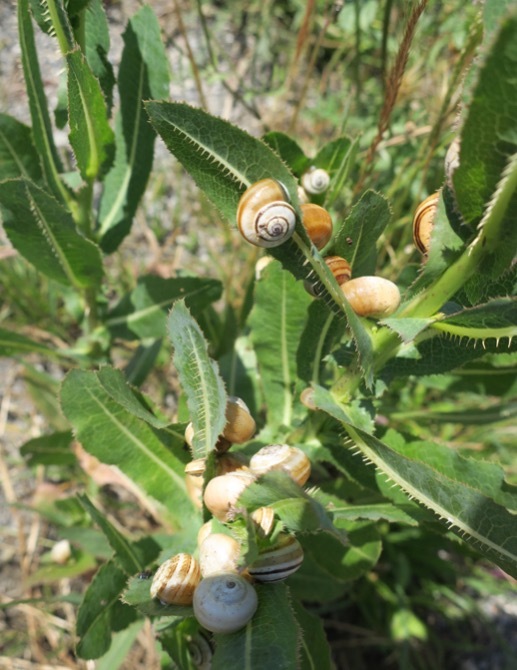 At one of our stops there were snails everywhere! 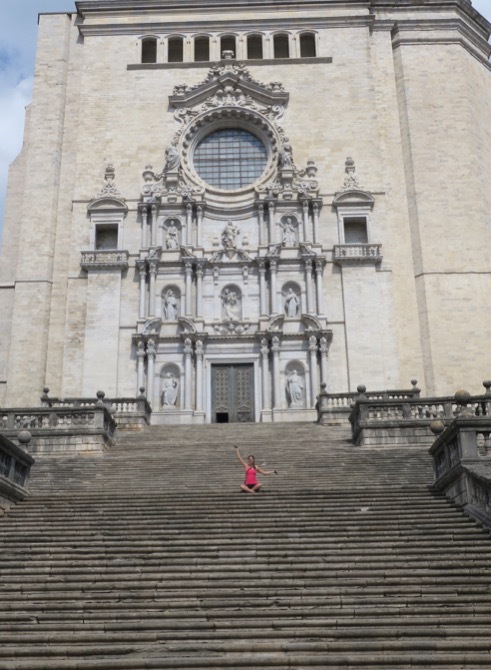 We cycled into the historic city of Girona and made our way through cobble stoned streets (where I am told Game of Thrones has been filmed) to the Girona Cathedral. Suddenly the street we were on gave way to a plaza and the immense cathedral enveloped the scene. We said goodbye to Girona and continued North, excited to land in the arms not of strangers but of friends. The two weeks prior to this trip I had been staying with a dozen international travelers on a ship building project in Roses, Spain. They had begun to feel like the ship building family I never had and I was thrilled when they offered to host us three sweaty cyclists for a night. We were taking what Google Maps offered as a shortcut to our destination when our country road turned to gravel. With google maps saying we were just 25 minutes away we figured our tires would tolerate the small stones. 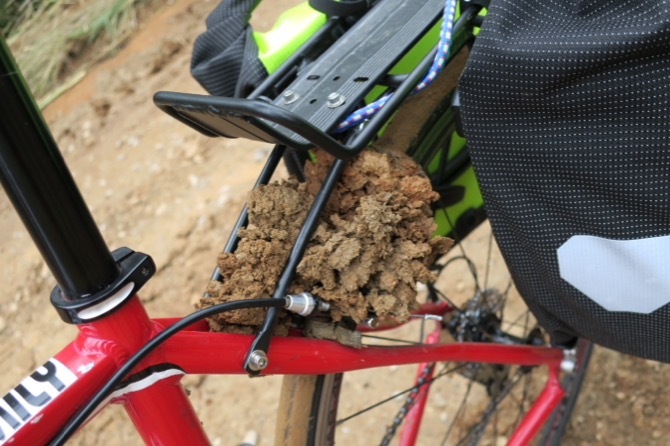 Then the road became dirt. Then it was dotted with road engulfing puddles. Then the road became sheer mud. Thick, tire grabbing, brake jamming, M-U-D. 18 more minutes Google said. We persevered. Then the road turned from mud to rocky, and in a moment of disbelief we realized the bridge we needed to cross didn’t exist. Thanks Google! Our options were to go back through the impromptu mud run we had just survived or continue through the boulderous hiking trail before us. We chose the unknown. 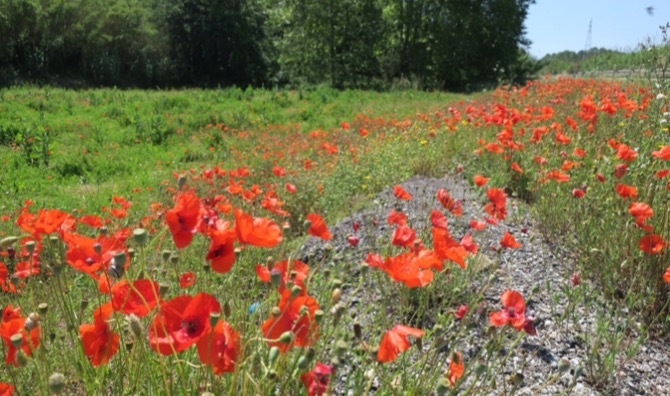 We worked our way through the rocky path and emerged in a farmer’s field. Only to discover Sunny had just increased our tally of flat tires of the day to two. Changing a tire takes effort in the best of conditions, it only gets more tedious when you add mud to the equation. Way to knock out that tire change expediently Sunny! 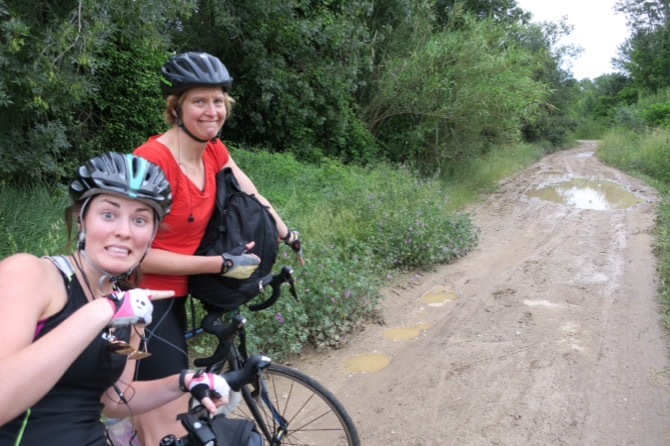 We rerouted to a small country road and arrived at our picturesque Spanish house with mud clad bikes and shoes. My ship building family was partaking in their Thursday night tradition of silent dinner when we arrived. Hands flew into the air in silent cheer and smiles abounded. It felt good to be home. After dinner verbal introductions were made and we migrated to the terrace to talk about our trip over tea. Later Matthew, one of the newest arrivals to the ship building crew divulged that he is a bicycle mechanic and would be happy to look at our bikes if they needed anything. I couldn’t believe my ears. Both Bita and I were having issues shifting in low gear, so we planned to have a bike repair session the next morning. Despite our muddy trials earlier, the day had ended with near perfection.